Hey, it’s my turn for the Make It Perfect tour! Toni designs comfortable and good-lookin’ styles, and I was so excited to try out her patterns. She sent me the paper version of the Coastal Breeze dress, and oh, I love not having to piece together PDF sheets. I seem to always screw up when aligning PDF patterns and various sheets wind up completely off-kilter. Does that ever happen to you? Anyway, I’m a fan of Toni and Make It Perfect! This dress is fantastic. Really, I’m already planning on making several more because this is exactly the kind of dress I reach for time and time again. You just can’t go wrong with knit (this is a cotton/spandex blend from here), and the deeper scoop neck, wider waist band and subtle pleating and gathering makes this a very flattering silhouette, I’m of the opinion. So the thing about this fabric is that I had no idea it would look like camouflage. This, despite the fact that it said “camo” on the bolt. I just thought they were cool, variegated stripes. But I love it! I think the camo effect is unexpected and slightly edgy. Full disclosure: I didn’t follow the instructions. I did glance at them, and they looked straightforward enough, but I decided to use my now go-to method of attaching neckbands flat (so much nicer), and because I was serging the edges, I opted to baste together the waistband pieces wrong-side together and treated them as one piece. I did make a quick muslin vaguely following Toni’s instructions and decided my methods would be faster and the end result looks good. This came together quickly, though it didn’t feel like it in my 100-degree sewing room. It doesn’t normally get this hot in Seattle so early in July, and it makes sewing in an upstairs room challenging. Still, through oceans of sweat, I did my usual “Oh!!!!! It’s SO cuuuute!! !” proclamations to no one in particular. The only change I would make is to sew a small next time. This thin knit in a medium is a little too loose on me, but better loose than straitjacket, I say. So lucky you, my dear readers, Toni is offering a free giveaway of a Make It Perfect PDF pattern of your choice! To enter the giveaway, please leave a comment with…hmmmm….how about your summer uniform? Are you a strictly tank top and shorts person? A flirty maxi dress gal? A cardi and jeans down-under sort? I myself am all about the knit dress…I will leave the giveaway open until next Friday, July 18th and will contact the winner that weekend. Good luck! And don’t forget to peruse the other gorgeous makes below. Thanks for letting me take part in the tour, Toni! UPDATE: Congrats to Sandra, the winner! Sadly, my summer uniform is t shirt and sweats….I would love to work on that! outside of work it’s a tshirt and shorts and sandals! but lately i’ve been wanting to wear skirts or nice simple dresses. thanks for hosting! Summer uniform….. Shorts and tank or knit dress. It’s too hot in San Diego for jeans. Your dress looks very cute. I am a knit dress girl (perfect for this pattern! ), just because they are so easy and comfy. I have a Boden dress that is very similar to this pattern! I stick to dresses and skirts in the summer. Shorts look terrible on me. I recently discovered your blog and have been enjoying it so much. My summer uniform is a light weight t and linen pants. I’d like to be a little more adventurous though! I’m a shorts and casual top girl. I’m actually making one of Toni’s waterfall shirts right now. Saw a beautiful one from miss matabi over a year ago…that Frances gets me with her cute fabric every time! This is gorgeous! This summer my uniform is knit dresses with leggings, probably because I’m pregnant and riding my bike. It’s the perfect combination for comfort, support and modesty. 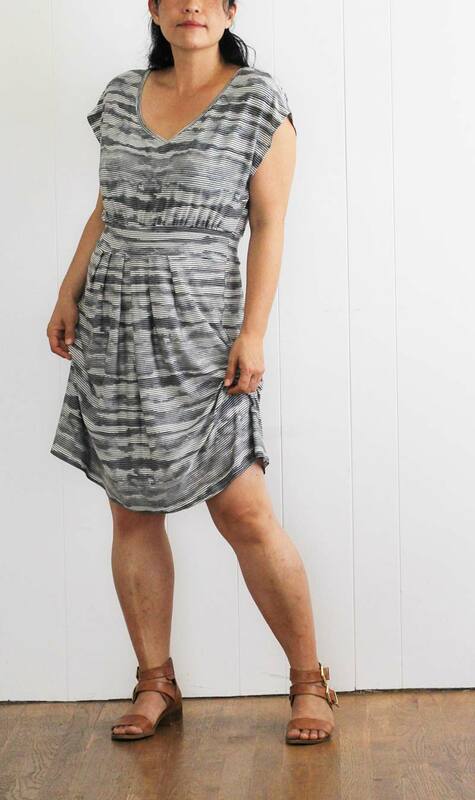 Funny, just like Amy said, I also have a similar Boden dress, which makes me want this pattern all the more (I love the dress, so flattering)! I’m more of a dress/skirt and top type of gal, though I’ve bought (gasp) my first pair of shorts in over 10 years this summer! I also have a couple of short patterns to get to. I don’t like the way shorts look on my usually, but with little kids to chase and sit around on the floor with, they are practical! Long shorts/ capris and tshirts for me, or a swishy skirt and T. I’ve not worn a dress for a long time, but working on the Colette Moneta at the moment – hopefully by the time summer comes around here I might brave a dress again! Summer dresses! I love that you have a whole outfit in just one garment. Especially in hot and sunny Australia where it gets too hot for a light summer jacket. I’m massively partial to a maxi dress too. I love your blog and every piece you have sewn, I want to sew them too! Thank you for the inspiration! My summer uniform are maxi skirts and Ts. That dress looks great on you! I had a moment where I thought I might make this one for myself, but I chickened out. Probably for the best, I am horrible at choosing knits! Beautiful. And that fabric is just wow!!! I used to wear tank tops and skirts but last since last summer I have lost a bit of weight (well, really I just shifted some fat into muscle) and all but one skirt were unrepairably too wide. So this year it is knit dresses because my woven dresses suffered the same fate. I keep trying to gear up and sew something for myself this summer. So far I have managed just one skirt but if I want to go back to tanks and skirts I actually need to sew tanks too..
Love that dress – stylish and comfortable – a total winner in my book! my summer uniform is a little cotton dress! fun bodice, sleeveless, and wide skirt is my idea of prefect. and i just throw on a cardi in the evening when it gets a bit chilly! Looks great!! My summer uniform is tunics and 3/4 leggings, though I’ve lost 24kg (with more to go), so it may be changing…. Knit dresses…in all forms and shapes! I have a new serger so I’m having fun with my new toy! Ohh I really like your version of the costal breeze dress. My summer uniform tends to be shorts or a skirt and a t shirt but a dress is so much cooler when it’s hot so I have a couple in rotation but now having seen your dress there is another pattern I want ! How great is that dress?! You look beautiful. I want the fabric! And that fabric store sounds really nice. Since I started sewing my summer uniform is dresses! love that fabric it is really beautiful and i like the movement it has. anyway my summer style is more skirt and t-shirt. i would love to say maxi dresses and floaty numbers but unfortunately the body does not comply plus with feeding my baby it has to be accessible. LOVE this dress Sanae. that is my summer uniform right there. A lovely knit dress that allows the breeze to get to where it needs to 😉 and in grey stripes,…. just perfect! I’m definiltly a tank dress person. With a jacket if it’s a working days. With sandals if it’s beach day. And with runners, if it’s a walking day. shorts and t-shirts/tanks for me, unless I’m home all day, then I wear sweats! Knit skirts with tees most days. Love your dress! I would love to wear pretty dresses all summer but I actually wear shorts, tees and jandals. Your dress is lovely! It looks so comfortable. My perfect summer wardrobe is a maxi skirt and a tee. And I don’t own a single one at the moment. Need to rectify that soon…once I’ve finished my current batch of kid sewing! I’m a t-shirt and shorts kind of gal. Love your dress though. I might need to make one. 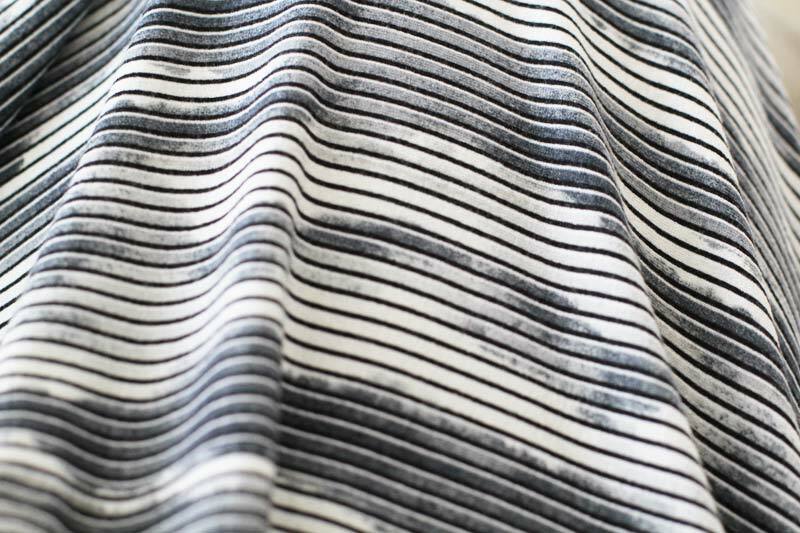 This is so stylish on you – great pattern. My summer uniform is anything with stripes, and dresses are always a treat as I never get to wear them to work! I am usually wearing a maxi dress or skirt and top in the summer. I love knit dresses. And i don’t think it looks like camo fabric…but it does look cool and i’d totally wear it. Maybe if t was army green. The camo would shine through more. Thanks for the give away! Love the dress, very comfy looking too. My summer wardrobe is a two parter. I love light tunic tops and shorts, with quirky flip flops for the weekend. The working week wardrobe is cropped pants, a light shirt and comfy flats. I’d love to have dresses but I’m too small for anything off the rack. I am an eclectic mix. Some days it’s dresses, some days skirts and tanks and some days it’s shorts/capri’s. I love mixing and matching things in my wardrobe! But one things for sure I love knits, so it almost always involves that! I wear tank tops and shorts during the day but I like sundresses for the evening. I never wear dresses and think it would be fun. I love the cammo dress!! Nice details and flattering fit! I always wear skirts and t shirt, or dress, with sandals in the summer. I never wear dresses in the fall or winter. I always wear jeans in the fall winter with sweater. I never wear jeans in the summer. So you can tell that we have hot summers and cold winters here. I like to wear simple skirts with cute shirts. My summer uniform is usually 3/4 jeans and so tee shirt but on the few days it gets really hot here I have been know to break out the odd maxi dress or full length skirt! Shorts or a straight skirt with a tee, for sure! Although I’m trying to get more woven tops sewn up, just so I don’t look too slouchy all the time! You so rocked this pattern, Sanae. And that fabric is fabulous! I can see this becoming a go-to dress. You look amazing, as usual! I just love your fabric choices. I’m really not into camo, but this looks edgy and fun! yeah, my summer wardrobe is shorts (if my legs are shaved-ha! Otherwise maxi skirts with biker shorts underneath- hot, i know, but man, my thighs touch and thats annoying) and a very loose woven tank. I found the perfect one in a store, snagged it for $5 and traced it. I made 4 so far and its all I wear! I thought my summer wardrobe would be woven Sorbetto tops with shorts so I cut and sewed 9 of them, assembly line style. They’re all too small! The muslin fit well so I’m confused as to what went wrong. Once my sewing mojo returns I’ll try again but right now I’m too sad! Seeing your projects is a great inspiration. I love the dress! I really love your dress! I’ll have to check out that pattern. I just bought some knit fabric to try and sew my first knit dress. Love easy cotton dresses just like this. Actually that’s my uniform pretty much all year round! This dress looks so comfortable and pretty. I love light weight blouses and capris in the summer and knit dresses too! 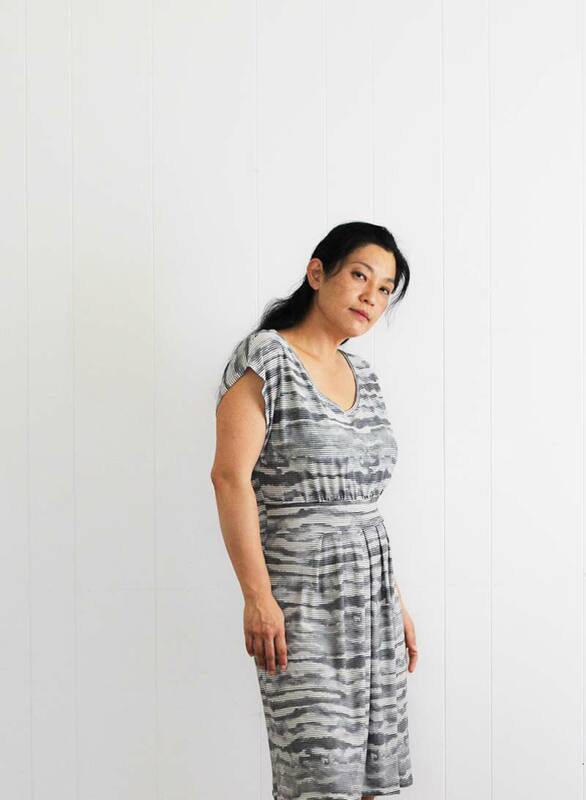 My summer uniform is tops and skirts, although if I could find the right pattern, I would switch to knit dresses in a heartbeat, and do away with that skirt waistband. Great dress and I love the fabric. My summer uniform is a vintage print skirt and colourful tee. I swore this year I would break out of the capri/ shorts and tee rut and make a few skirts, but well I’m not there yet! I would love to give this dress a try- looks comfy, but sophisticated! Thanks for sharing! Oh summer, I’ve forgotten what that’s like. It is the middle of winter here in NZ, but summer does come around, I love to wear shorts and sleeveless top. It’s been hot here, so it’s been maxi dresses and long skirts, today I wore a long sleeve top just to give my arms a rest from the sun! My go-to outfit is always a dress! I’ve tried skirts, but it’s too much stress trying to match shirts. Hmmmm…I would say shorts (twill or denim) and knit tops – most with sleeves. I’ve even sewn a pair of shorts for the first time ever! Just came across your blog this evening, and I really like your style. I think you’re one of the first sewing bloggers I’ve read recently whose fabric choice and pattern style I identify with!